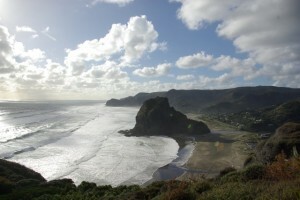 Piha is one of, if not THE most famous beach in New Zealand. It is reknowned for its superb scenic beauty and its surf, all just 40 minutes drive from Auckland CBD. 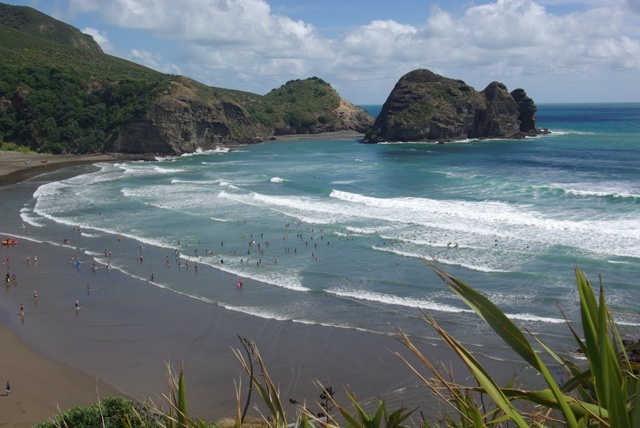 From the 1930s Piha was discovered by sportsmen who tested their prowess with Hawaian surf boards, surf boats and body surfing. Malibu board riding arrived in 1958 and Piha has ever since been a popular destination for surfers. There is barely a day when the dawn does not already show surfers out on the bar beside Taitomo Island or on the south or north sides of Lion Rock.Â The quality of surfing changes accordingÂ to the wind and with the movement of large slugs of sand up the coast. 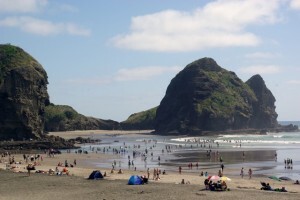 Piha is highly popular with beachgoers who come to swim and lap up the sun on the beach. There is beachfront parking, which is not good for the dunes, but makes the beach very accessible, adding to the high numbers who visit. When beachfront parking is full, people park in the Domain andÂ walk a short distance to the beach. 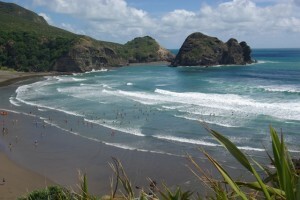 Â The safety of beachgoersÂ is guarded by the Piha Surf Club which was the first club on the coast, established in 1934. ThereÂ are public toilets and changingÂ shedsÂ in the middle of the beach, next to the Moana Stream. There is one takeaway on the beach, Blairs, serving icecreams, drinks, and simple takeaways. Piha is the location for the filming of Piha Rescue reality television sereis, now in its seventh year.